Birthdays are great excuses for me to bake cake. In this time of the year, you would definitely find one or two cake recipes on my blog. Two birthdays that are close to my heart come during this time. Two years back Mix and Stir was born around this time and my husband's birthday is also at the beginning of March. 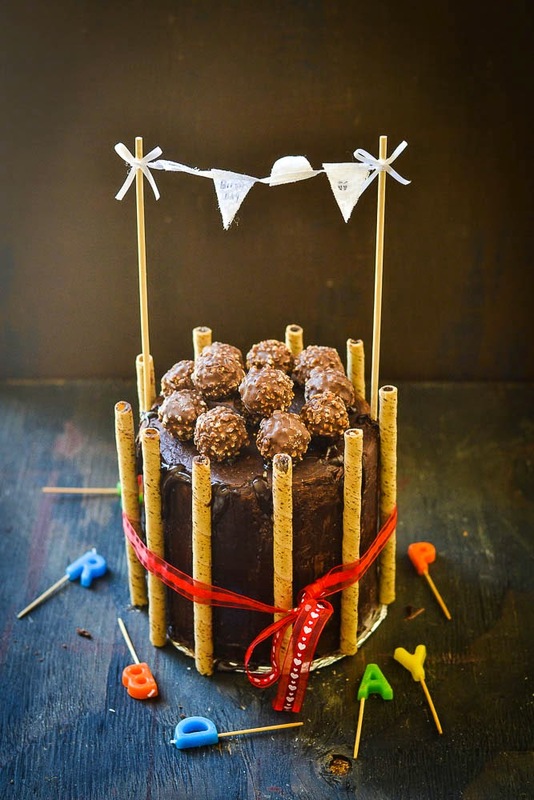 When we celebrate any birthday in our family, I generally ask what type of cake they would like to have, even though I know the answer from my son will always be Chocolate. 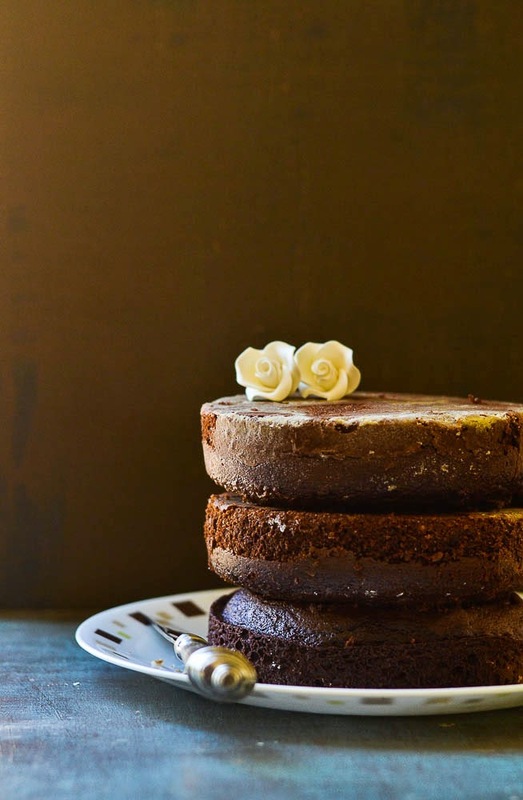 There are three different components involved–cake, mousse filling, and ganache. The final layer of the chocolate is the silky ganache that is not so difficult to make. It contains only two ingredients – heavy cream and semi-sweet chocolate chips. 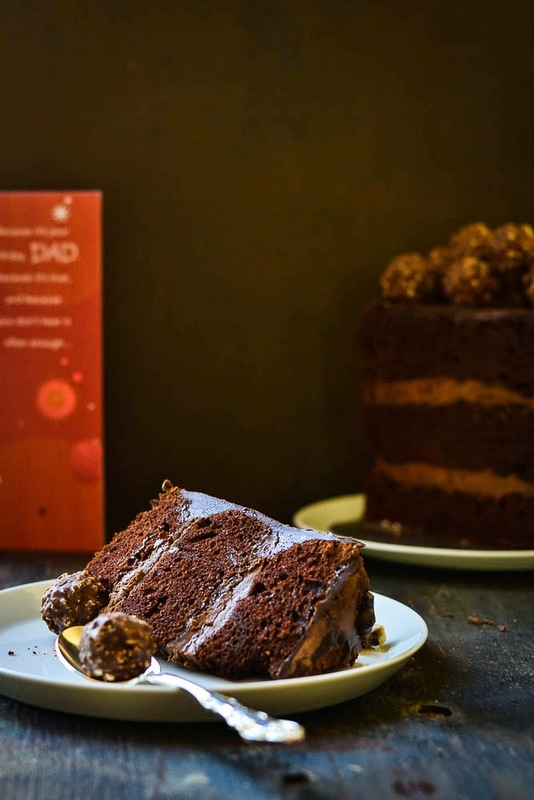 When you mix up all three of these divine elements of chocoholic joy into one bite, you create the most delicious chocolate cake that you will ever have in your whole life. I like baking but when it comes to cake decoration, it’s not my comfort zone. I don't have even cake stand or an offset spatula. 1. Preheat the oven to 350 degrees F or 170 degree C. Lightly grease an 8-inch round cake pan. 2. In a large mixing bowl, sift the all purpose four, baking soda, baking powder, cocoa powder and sugar. Mix together, and add the wet ingredients one by one. 3. Mix all the ingredients, using a wooden spatula or you can use an electric mixer. mix it until all the ingredients are well combined. 4. Divide the mixture into the three parts. Pour the batter ( 1/3 of the batter ) in the prepared pan and spread the batter evenly. 5. Bake for 20 minutes, or until a toothpick inserted into the center of the cake, comes out clean. You can use three different pans, or bake the other two parts like the same way one by one. 6. 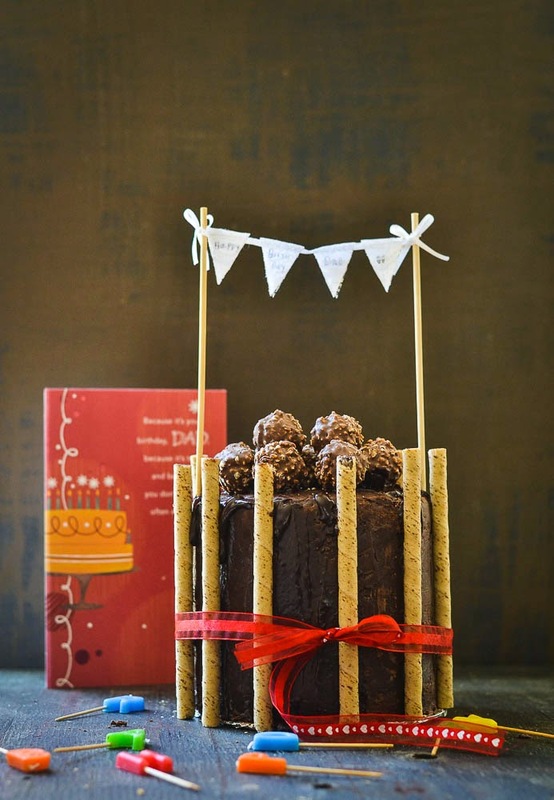 Let the cake cool down slightly, then remove the cake to a rack and cool completely. Wrap and chill until ready to assemble. 1. Take a saucepan, add water. Bring about an inch of water to a simmer in the saucepan. 2. Set chocolate chips in the bottom of a metal or glass bowl, make sure it is heat-proof. Set the heatproof bowl in the mouth of the pot, make sure the water does not touch the bottom of the bowl. Stir chocolate occasionally as it softens. When the chocolate chips are almost soft, remove bowl from heat. Mix the chocolate nicely, stirring it. 3.Once the chocolate is melted, set aside to cool slightly. 4. Whip the heavy cream in the stand mixer using the whisk attachment or using electric mixer. Whip until it thickens and peaks form. 5. Add the butter and melted chocolate. Whip for another 30 seconds or until the mousse is thick and fully blended. Once it is done, chill it until ready to use. 1. Take a heatproof bowl, put the chocolate chips and keep it aside. 2. Take a saucepan, place cream and butter in it and heat it over medium heat, bring it to a boil. 3. When it just starts to a boil, immediately pour the boiling cream and butter mixture over the chocolate chips. Let it rest for couple of minutes, then stir until the mixture gets smooth, beat it with a wire whisk till it becomes soft and fluffy. 4. This is the final step, which is to assemble the cake. Once the cakes are completely cooled, wrap in plastic and place the cake in the refrigerator for at least an hour. This makes the spreading of the frosting a much easier task as a freshly baked cake is quite fragile and when you try to spread the frosting, there is a tendency for the cake to tear. 5. Cut the top swelling parts off of each cake. Place the first layer of cake on your serving plate. Spread with half of the chocolate mousse. Place the next cake layer on and spread with the remaining mousse. 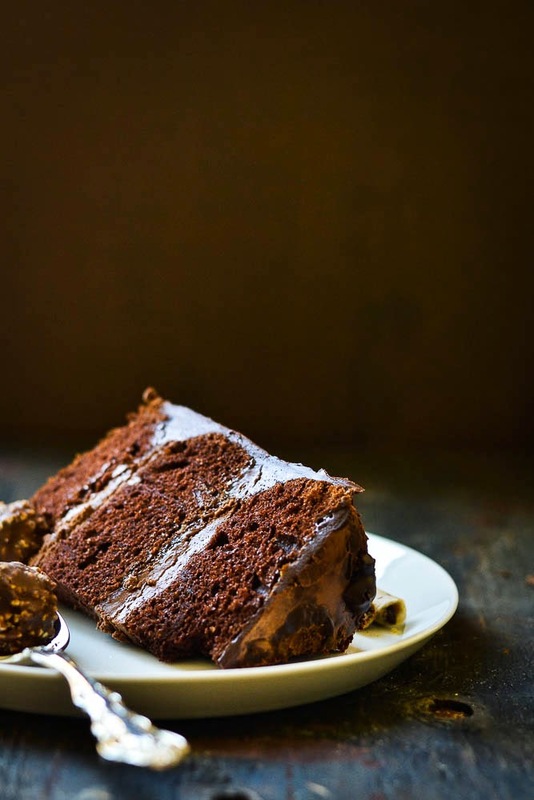 Place the last layer of cake on top and slowly pour the ganache over it to completely cover the top. It will run over the sides of the cake. 6. 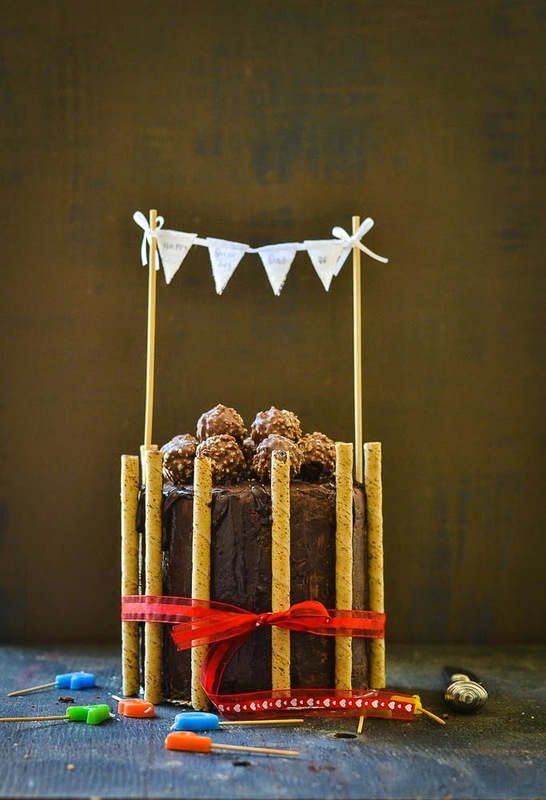 Decorate with more chocolates, as I did with ferrero rochers and chocolate wafer rolls. Note : Any leftover cake can be refrigerated or frozen. Cover with plastic wrap and put it into the freezer or refrigerator. It stays fresh for couple of days.